Are you looking to add seamless gutters to your home this year? Are you wondering what the benefits of seamless gutters might be for your home? Maybe you’re simply wondering what seamless gutters are and whether they’re something you should be looking into? At Minnesota Leafless Gutters, we’re seamless gutter experts, and we’re happy to help answer any questions you may have about seamless gutters in addition to installing beautiful, affordable and durable seamless gutter systems. Our St. Paul, MN seamless gutter company has been around for a few years, helping homeowners design their own seamless gutter systems, helping them choose the perfect styles, materials and colors for their properties, and we want you to be next! If you’re wondering just what exactly seamless gutters are (and whether you and your home could benefit from the installation of a seamless gutter system), you’ve come to the right place. 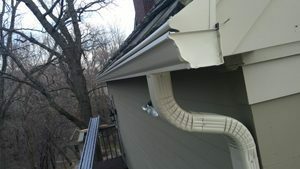 Seamless gutters are just like most gutter systems, but instead of being made of smaller, interconnected and welded or connected gutter sections, seamless gutters are built using longer stretches of gutter material, ensuring that there are no “seams” in your gutters to trap debris or make cleaning your gutters more difficult. Because of the nature of seamless gutters, they offer several advantages that more traditional, older gutter systems simply cannot. With seamless gutters, you’ll find that they’re easy to clean, and they need to be cleaned far less frequently than gutter systems that have seams. In fact, we also install gutter covers, which prevent virtually any debris from slipping to your gutter system, ensuring that your gutters stay almost completely clean without you doing any work to clean them out yourself. That means no more climbing your ladder twice a year or paying someone else to get the job done for you. In addition to staying clean, you’ll also find that cleaner seamless gutters offer the major advantage of being far less susceptible to damage. When there’s less of a chance of your gutters being plagued by blockages and build-ups, your gutters are protected from the very things that can cause leaks, rotting, rust, and more, ensuring that your gutters last for several years – if not decades! Whichever material you choose, you’ll also be able to search through hundreds of gutter colors to find the best match for your home, and you make the final decision on each choice, from the material to the gutter style to the color choice. To start planning your seamless gutter system, contact Minnesota Leafless Gutters at (612) 221-0362 or mnleaflessgutters@gmail.com, and speak with our St. Paul, Minnesota seamless gutter contractors today.